Wish you could meet more people and share work and ideas? In its second year, this active, fun and free event is for media and communication students across the college (anywhere on campus, really) where students can get to know other students who share their interests as well as students who don’t. Play some, work some, learn some, make some, solve some…it’s all here. Mix with whoever is in the room like filmmakers, web and graphic designers, game developers, photographers, writers, illustrators, audio specialists, programmers and more. There’s nothing to join, just show up. And eat pizza. There will also be an opportunity in the Spring to get out and help your community with media related services, like helping homeless kids tell their stories with camera and audio or helping a small mom-and-pop business get going on social media. If you’ve taken CAS 110, the creativity class in the college (you know, the really HUGE one? ), then you know Karl Gude. He’s running this show. Please join a student club in your major or area of interest! 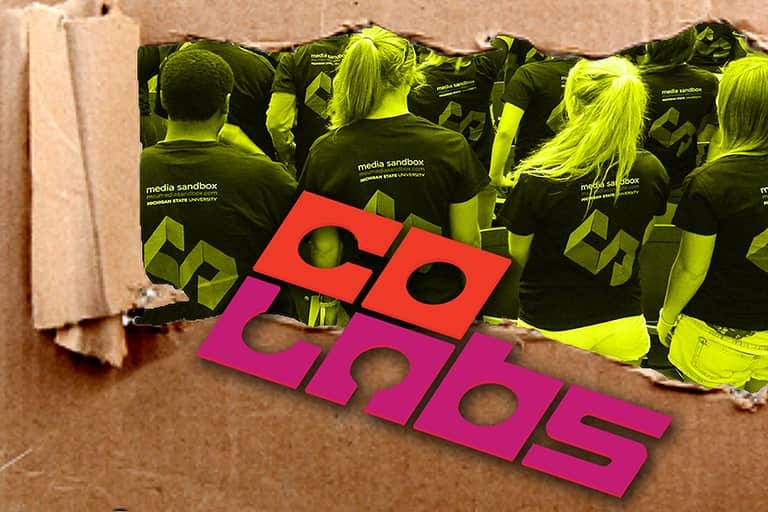 The CoLabs isn’t a substitute for the wonderful student groups in the college where you can really drill down on a media subject and learn some cool stuff. But members of those clubs are all welcome!